Question: What do some BC HighwayCams and seismic sensors have in common? Answer: A shared power source, a dedicated team of ministry staff and a great outcome to boot! 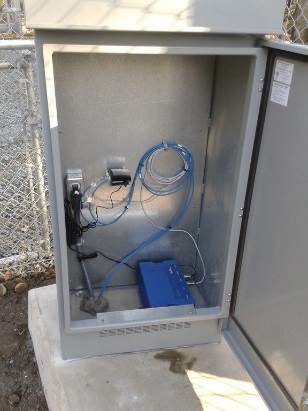 That’s because our webcam crew and seismic engineers are teaming up to expand the BC Strong Motion Network by installing seismic sensors inside BC HighwayCam power boxes and using the power on hand to run them. 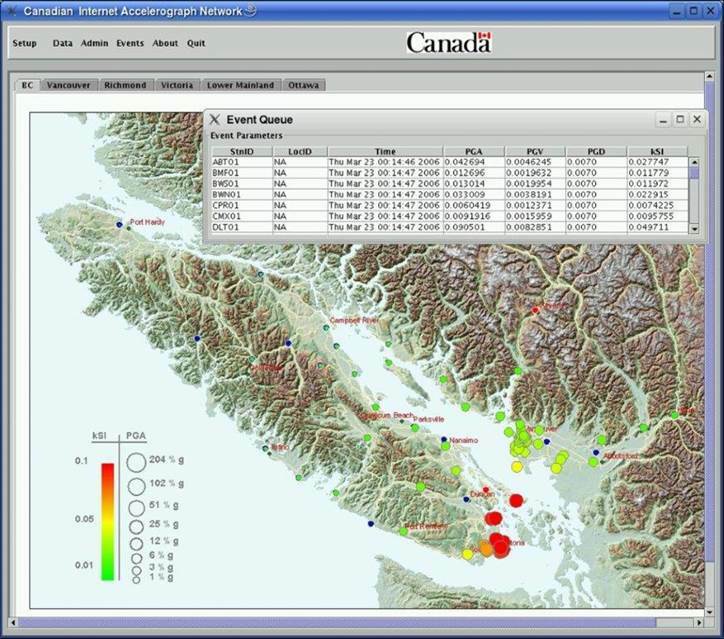 These “tag team” sensors are part of a larger, provincial Strong Motion Network (SMN), made up of more than 100+ sensors located across coastal BC that measure the intensity and acceleration of an earthquake after an event. Seismic data collected from these network sensors is used to build dot maps and shake maps on the BC Smart Infrastructure Monitoring System (BCSIMS) website. Our engineers use these maps to compare an earthquake event with the seismic threshold that specific structures, such as bridges and tunnels, are designed to withstand. This critical information helps them focus their attention where it is needed most during an earthquake emergency. When an earthquake occurs, sensor station dots will “grow” relative to the acceleration measured and change in colour from blue to red (with increased energy), approximately 1-3 minutes after the event. At that time, you can click on and read the measurements at the stations. You can get the overall impact information or zoom in for clearer view of “your” dot. This is particularly useful when the “dot” is close to you. Dot maps help emergency managers get a quick idea of where the strongest motion occurred so they can identify priority sites and focus resources there. Shake maps take a little longer to populate because they pinpoint the location of the earthquake, but they also help emergency managers estimate damage in order to focus inspectors and first responders where they are needed the most. So far we have teamed these sensors up with the BC HighwayCams at French Creek, Malahat , Port Edward, King George Hwy, Highway 99 at Mud Bay, Highway 91 at No. 8 Road and on Highway 91A at Boundary Road in the Lower Mainland. It’s a good start but, because shake maps require estimation between stations, a greater density of sensors means faster and more precise shake maps. 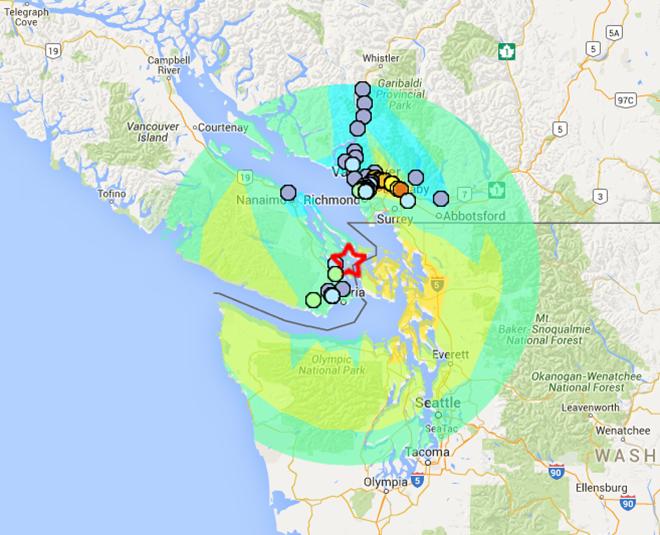 We plan to install many more sensors in earthquake prone areas along the coast of BC. We think this tag team match up has the makings of a great partnership, don’t you? Do you have any questions about this or any other work that the BC Ministry of Transportation and Infrastructure does? Let us know in the comments below. We will be building a new house above the shores of Cordova Bay on Parker Avenue. Would the government be interested in installing a seismic sensor station on our property? If so, probably good to do it such that it might be integrated with the house design prior to the beginning of any construction. We have sent your question forward to our seismic team for review. Because this address is not on a provincial highway system, it may be a municipal question. Stay tuned. When are we going to have an app that will give warning an earthquake is happening? The technology exists – someone needs to implement it in Canada. That’s a great idea Brian – one we hope developers are working on right now.